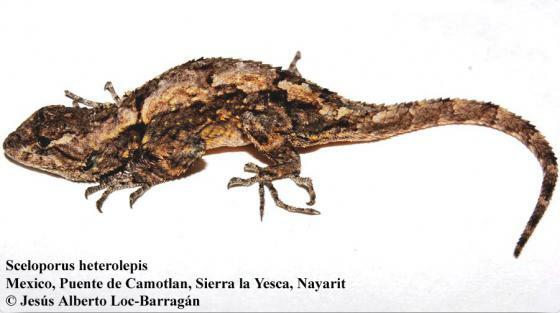 Can you confirm these amateur observations of Sceloporus heterolepis? Type locality: La Cumbre de los Arrastrados (to which the type locality is restricted by SMITH & TAYLOR 1950), Real Alto “Riocho” [= Rancho ?] La Berberia, Sierra de Bolaños. Comment Subspecies: Sceloporus heterolepis shannonorum LANGEBARTEL 1959 is now considered as a valid species. Etymology The Greek words heteros, "different," and lepido-, "scale," refer to the noticeably unequal sizes of the dorsal scales.